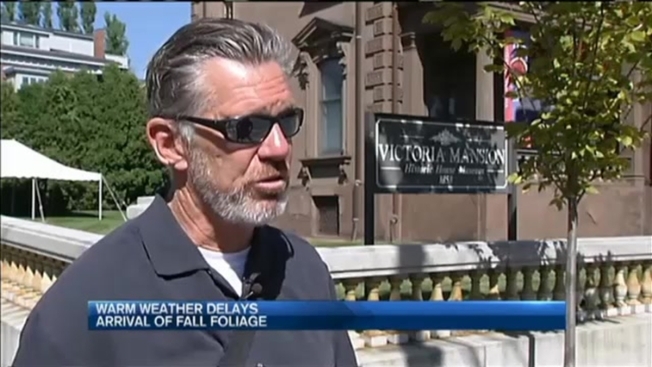 The unseasonably warm weather this September has caught some New England tourists who booked fall foliage tours off-guard. Typically, some of the leaves have changed by mid-September, but the official fall foliage map from Maine.gov shows the entire state is still green. “Weather plays a significant role in the changing of the season," said fall foliage coordinator Gale Ross. "Sunny days, followed by cool, but not freezing temperatures help move the progression of color along. We have not experienced the cooler evening temperatures in all 7 zones." But leaf-peeping tours are often booked well in advance. Tour guide Peter Lyons said he took a group on a bus tour to Mount Washington Thursday -- and the only color they saw was green. "They anticipated they would see some color in the leaves, and you tell them it's going to be all green going up there -- and there's a little disappointment," said Lyons. He said he has been pointing out summer-related activities still available in Maine, and assures leaf peepers that the foliage will be "spectacular" in a few weeks. Tourism officials say they don't expect leaf peepers to cancel their trips to Maine due to the delay in foliage -- they think they will simply find new things to do. "It just extends our tourism season, so it's good for everybody," said Robert Witkowski, spokesman for the Portland Convention and Visitors Bureau. Joanne Saunders came to Northern New England from the Boston area hoping to see the fall foliage in the White Mountains. "We're going to be taking the lighthouse cruise instead," said Saunders. "There's always something to do in New England. [Leaf peeping] can wait."